Landers Chrysler Dodge Jeep Ram of Norman, Oklahoma, has a huge selection of all-new 2019 Jeep Wranglers available now! One of the most beloved Jeep models of all time, the Jeep Wrangler features several exciting new upgrades in its most recent iteration! Only recently named the 2019 Motor Trend SUV of the year, the newest version of the Jeep Wrangler will have you longing for extra days off just so you can take it for a spin — or twenty. Follow along to find out exactly what’s coming to the latest and greatest 2019 Jeep Wrangler. Click here to check out our selection now! Performance: True to typical Wrangler fashion, the all-new model comes fully-equipped and ready to handle all the rough driving you may send its way. With the Trail Rated badge emblazoned across it, the 2019 Jeep Wrangler had to conquer a series of strenuous and grueling tests over some of the world’s toughest terrain. 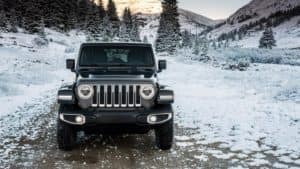 The 2019 Jeep Wrangler also boasts two mighty powertrains to choose from: the 2-liter Direct-Injection Turbo Engine and the 3.6-liter Pentastar V6 Engine. Arriving standard in the all-new Jeep Wrangler is the 2-liter Direct-Injection Turbo Engine that generates up to 270 horsepower and 295 pound-feet of torque. That gives the entry-level Wrangler a gas mileage of 23 in the city and 25 on the highway, as well as a max towing capacity of 3,500 pounds. If you’re looking for a little more power for your new Jeep Wrangler, opt for the 3.6-liter Pentastar V6 Engine that gives the latest Wrangler a whopping 285 horsepower and 260 pound-feet of torque. Either way you choose, the 2019 Jeep Wrangler is ready to perform. Technology: Not only does the 2019 Jeep Wrangler come fully-loaded with a powertrain that’s brimming with power, but it also comes jam-packed with the latest in automotive tech. For example, the super-modern, fourth-generation Uconnect system arrives standard in the all-new Jeep Wrangler and includes a familiar pinch-to-zoom display, significant performance improvements and vivid clarity with improved resolution and brightness. The optional 7-inch Multiview Driver Information Digital Cluster Display also lets you completely customize your personal settings and graphics to make the 2019 Jeep Wrangler totally yours. Ready to rock out? The available Alpine Premium Audio System has eight high-quality speakers and a rear subwoofer for maximum jamming in your Jeep. Apple CarPlay and Android Auto compatibility also ensure that anyone with a smartphone can access their information directly through the new Wrangler at any time. Design: Familiar in form — but still updated for the 21st century — the 2019 Jeep Wrangler has an undeniable sense of style. Still rocking the seven-slot grille, the all-new Jeep Wrangler has eight different wheel options for epic customization and personalization. Want a crystal-clear view of the trail ahead? The fold-down windshield available on the 2019 Jeep Wrangler makes it easier than ever to feel like you’re in the middle of the action! You can even choose from a no-top, soft-top, or hard-top option, so your new Jeep Wrangler is perfectly designed to match your lifestyle, and no one else’s. Ready to do some off-roading in an all-new Jeep Wrangler? 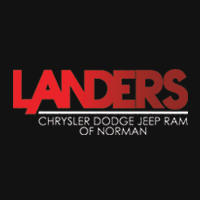 Visit us at Landers Chrysler Dodge Jeep Ram of Norman today–click here!